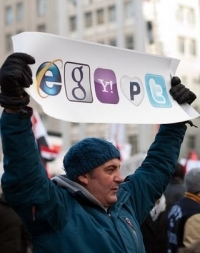 Well before the Arab Spring and the current direct democracy movement, Clay Shirky not only argued that social media represented the “greatest increase in human expressive capability in history,” but that it would radically empower individuals at the expense of their own governments. In response, a more skeptical Evgeny Morozov cautioned that there was a flip side to this ‘good news’ story – i.e., both the internet and social media can just as readily enhance the legitimacy of authoritarian regimes (and stifle political change) than not. Well, given the dual nature that social media has, and given our incorrigible optimism here at the International Relations and Security Network, today we would like to burnish further the pro-empowerment case. In particular, we would like to look at Gene Sharp’s legendary handbook of non-violent resistance,From Dictatorship to Democracy: A Conceptual Framework for Liberation, but from a social media perspective. Since its publication in 1993, Gene Sharp’s 93-page handbook of non-violent resistance (which lists 198 specific tactics one can use, including the use of symbolic colors and appeals to international audiences) has arguably become THE how-to guide to topple autocrats. To date, some of its biggest ‘victims’ include Slobodan Milosevic in Serbia, Victor Yanukovic in Ukraine, Eduard Shevardnadze in Georgia, and Askar Akaev in Kyrgyzstan. In all cases, these regimes had a common denominator – they were all largely undone by popular movements employing Sharp-like methods. Most recently, such methods have been influential in the toppling of Zine El Abidine Ben Ali in Tunisia and Hosni Mubarak in Egypt and have also been used (in part) in Libya and Syria. Indeed, their use has prompted some commentators to speak of Gene Sharp as the Arab Spring’s “intellectual mastermind.” Although such an accolade may not be deserved, the trajectory of the Arab Spring and the methods that Sharp recommends did coincide. Whether the demonstrators realized it or not, the uprisings were right out of his playbook. Sharp’s suggested tools for social change are inspired by an incisive theoretical understanding of how authoritarian regimes maintain power. His principles of non-violence, as he is always keen to stress, are not altruistic or derived from moral or religious imperatives. Instead, the methods he advocates are a form of armed political struggle – with psychological and social ‘weapons’ being used rather than military-industrial ones. Not only is non-violence a viable alternative to violence, Sharp argues, but in most cases it is also less costly and far more effective. The empirical hypothesis, in other words, that violence is the most effective way of pursuing political objectives, although still believed by many, is false. And, as regime after regime collapses, the weight of evidence supporting Sharp’s arguments is becoming overwhelming. The key insight behind Sharp’s prescriptions is that power is not “monolithic.” It does not derive from any single source, or from those who are at any given time “in power.” The key tool of contemporary authoritarian regimes, Sharp implies, is the idea that power ought to be measured exclusively or primarily in terms of the capacity for violence. This idea leads to the popular belief that a regime’s power is irresistible because of its exclusive possession of military-industrial weaponry. In other words, the power of authoritarian regimes derives not from their actual military might but from thefear of their might and the popular belief that obedience is the only realistic option. Indeed, when rebel groups resort to violence they buy in to this authoritarian propaganda (whether they ultimately win or lose) by agreeing to fight the regime on its own terms (which means they usually lose). Though fully totalitarian regimes are extreme cases, the deliberate atomization of society through fear is a tactic common to all dictatorships. Because legitimacy is a mass phenomenon, credibly denying it to a hostile regime requires a ‘critical mass’ of people – and it generally requires them to appear together in public to make their case. This is exactly what atomization strives to make impossible. Its goal (through a variety of means) is to turn every individual in a society into an informant, and thereby preclude in advance any ‘dangerous’ exercise of popular power. And this, Shirky claimed yesterday, is where technology can change things. If social media and other related technologies have the capacity to be politically transformative, it is because they make atomization infinitely more costly for authoritarian regimes. Indeed, one of the most striking things about Gene Sharp’s account of power (seemingly inspired by Hannah Arendt) is that it explains why social media is so politically significant. Atomization works not only by cutting individuals off from potentially like-minded others, but by preventing them from even believing that they are out there. Social media’s “many-to-many” communications model is therefore revolutionary from a strategic perspective because it makes the possibility of de-atomization real and obvious. Today, as never before, almost everyone knows that it is technologically possible to reach and communicate with almost everyone else.